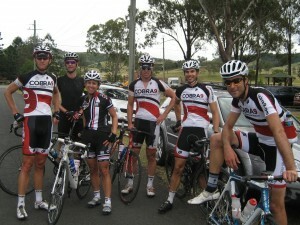 Last Sunday saw the guys from Cobra9 undertake another new and exciting challenge. 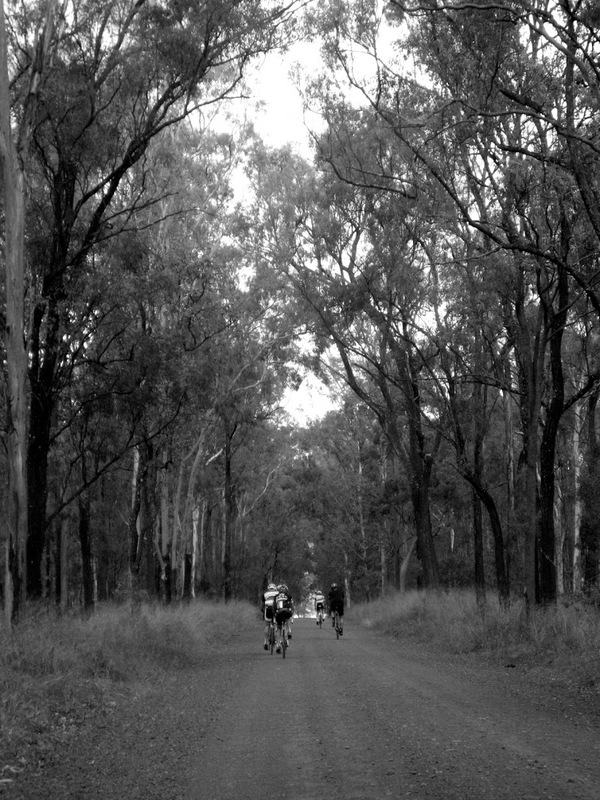 The Rapha Gentlemen’s race had come to Queensland and for five hours, a few of us were lucky to experience a little cycling nirvana. I wouldn’t classify the Rapha Gentlemen’s ride as a race. I feel that label cheapens and simplifies what this event and what Rapha is attempting and essentially achieving. This event represents a relaxed, funky and ultimately inclusive atmosphere indicative of what cycling can entail. 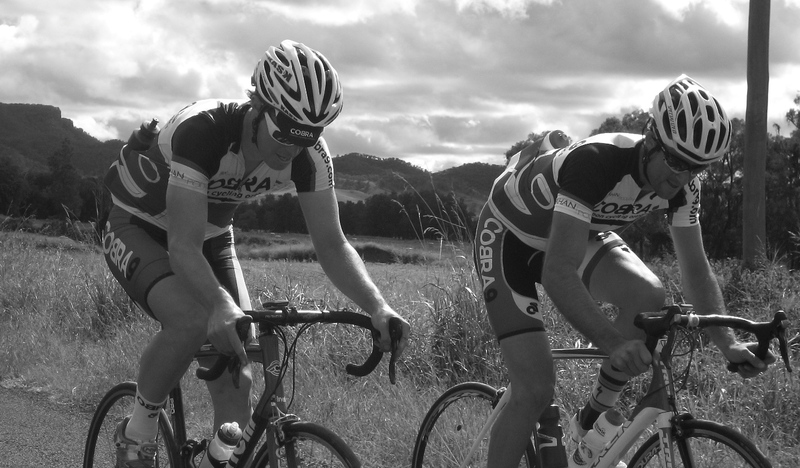 The Gentlemen’s ride separates itself from other more mainstream events by reducing the separatist elitist culture that often permeates competitive road racing. It provides this through the use of a team format incorporating the mandatory inclusion of females combined with a 146 kilometre race distance and parcours conducive to inevitable suffering. And as they say, “it is our suffering that brings us together”. 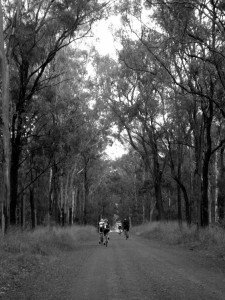 The inaugural gentlemen’s ride was held in the Scenic Rim in south east Queensland. As such, it took in the rolling hills and windswept gravel roads that unravel towards the prehistoric volcanic rock outcrops well known in this part of Australia. The weather was kind with only a few brief showers punctuating the hour long drive to the start point in Mt Alford township. As soon as we arrived, coffee in hand it was obvious that this was not your usual weekend race meet. Lots of hirsute men with shaved legs outfitted in the latest of trendy Rapha designs milling about conversing enthusiastically about the day ahead. Not a wind trainer, massage table or deep dish wheel in sight. To be honest, I didn’t miss them for a moment. Instead, cyclists mingled discussing tyre widths and whether they would have enough inner tubes to see them through the inevitable punctures. 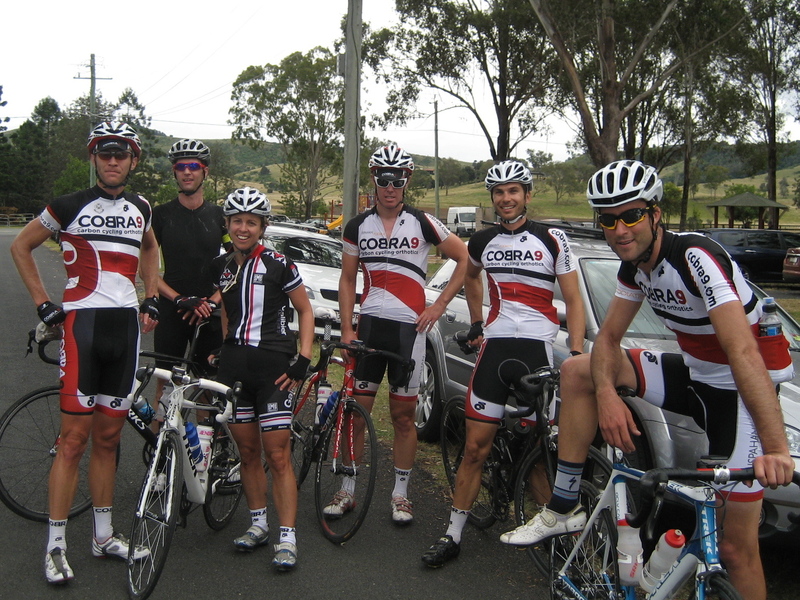 Our little team from Cobra9 consisted of a few regulars and a soon to become cherished new member, Kate. We had searched far and wide for the elusive female member of the party, and with a little trepidation, Kate stepped up. After a round of introductions, Kate nervously mentioned that she had never ridden this far before and had only ridden over 100 kilometres on one occasion. With this in ours minds and the adrenaline pumping through our systems, we set off on our journey. After a nice roll through some gentle terrain, the first taste of gravel was a short and harmless jaunt through the local show grounds. Instantly you are aware of how foreign the loose surfaces are under the narrow tread of road tyres. With this obstacle ticked off the list it was on to the hills. The next 30 kilometres are dotted with short steep 15-20 percent climbs. These are not long enough to deplete you in one serve, but enough to pepper your legs. After a series of these, our legs were suitably warmed up and to our amazement, Kate just kept knocking them off. So much so that before we knew it we were on to the flat lands and the gravel. I had envisioned gravel of the small blue metal variety with a firm sandy base but the section before the Cunningham highway was rough. Golf ball sized rocks littered the road and one of these was enough to provide us our first puncture of the day. Whilst a few of the boys tinkered with spares and repairing the side wall of the tyre, Kate, Adam and Dugald proceeded up the road. The ability to change a tyre and repair a bike are features of the Rapha ride as self self-sufficiency is celebrated. Thankfully we had mountain biker Rupert along with his Teflon fingers to change tyres faster that I though possible. Once repaired, it was a 3 man time trial to chase down Kate and guys which proved longer and harder then expected. Again Kate had been up to the task and rolled along at a nice clip. Once united it was a time to turn around and head back into the wind. The second half of the Rapha ride was where the going got tough. The wind blew swiftly back into our face and the gravel made an unwelcome return. This time it was the long stretches around the township of Rosevale. By this point we had passed numerous teams bent over wheels chatting animatedly but genuinely enjoying themselves amidst the fatigue and weariness of the ride. Whilst the core of this event is participation, human nature dictates a certain level of competitiveness. I could see a little sparkle in Kate’s eye each time we passed another slowing team. However, the long stretch of gravel eventually took another victim. This time it was Kate who suffered a rear puncture only to be magnified by a slightly undistinguished dismount from her bike. No real damage done, a quick wheel swap with Rupert and Kate was on her way again with the assistance of Matt, Adam and myself. Rupert and Dugald, both mountain bikers, soon caught us again after making repairs and we left the last strip of gravel behind us and headed for home over Mt Alford. With 30 kilometres to go, I had fully expected the team to be nursing Kate home with ever worsening fatigue and cramps. 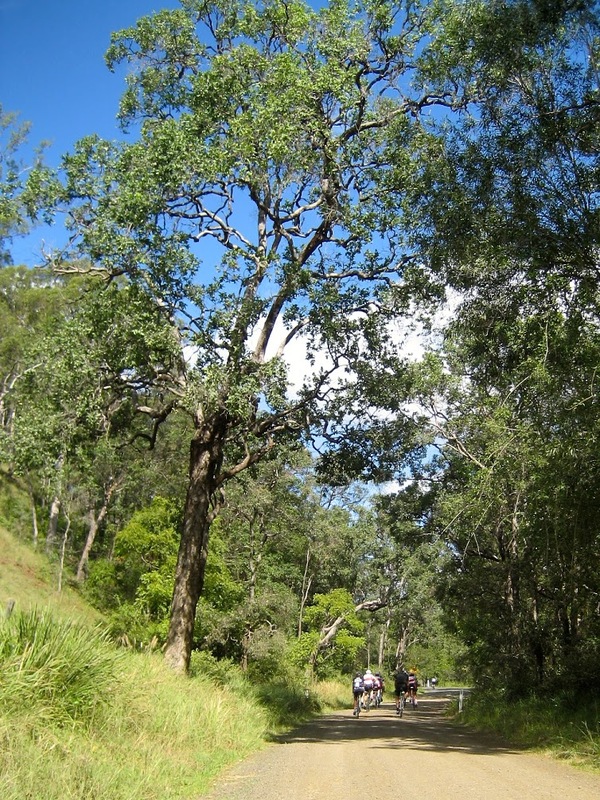 To make matters worse, the last portion of this circuit marks a return to the short sharp bergs, then a steady climb over Mt Alford skirting pretty Lake Moogerah. Despite this, Kate was showing very few signs of faltering. I am sure by this point she was sick of hearing dehydrated platitudes but as the scale of her feat drew nearer, so too did the level of praise. She had bested both her previous longest ride and exceeded her fastest average all on the same day. All that awaited was Mt Alford. As it happened, we need not have worried. Dugald proved that gender knows no dehydration bias by cramping instead (which he duly rode out) and Kate ticked off Mt Alford like a seasoned professional. Her form on the bike looked better then at the days commencement and her ability to ride in a bunch had improved tremendously. As we rolled back into the township of Mt Alford, the enormity of the day swept up on us. Relief, satisfaction and fatigue enveloped us in a warm post ride blanket. I have had many wonderful experiences on the bike but for pure satisfaction, this one was hard to top. Whilst we set off in as individuals in a team time trial, we arrived home as a team. A better bonding experience would be hard to find. A few cold beers and a county pub rump steak topped it off. Done and dusted. Rupert shows how to straddle a bike proper! Overall we performed well coming in second overall behind a truly efficient and deserving University of Qld team. Kate’s imperious efforts were no doubt the highlight of our long hard day although riding rough shot over the gravel roads chatting to your mates in Queensland’s beautiful countryside is spectacular. We have all made pledges to reform for whenever Rapha decides to bless us with another event. Thanks must go to the organisers from Rapha especially Sarah Bowman and to the guys at Crankstar for inviting us. Thanks also to the other genial teams who greeted and quipped with us on the way, and to our families who let us ride these events (on Mother’s Day) knowing what a utopian experience they may be.